Quick summary: Students investigate the adaptations of the human hand and foot, and speculate about the role these played in human evolution. Students are asked to observe the structure and motion of their own hands and feet and report on their observations. Students understand the significance of the opposable thumb in humans and how this has influenced our evolution. Students recognise a range of adaptations of the human hand and foot. Students recognise how human feet and hands have evolved from the same homologous structure. 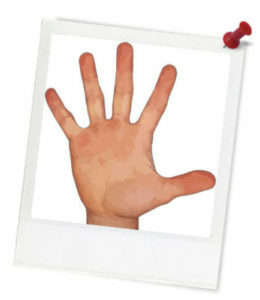 Resources required: X-rays of human hands and feet, pencil and ruler for each student, Student Worksheet – one copy per student OR computers/tablets to access the online worksheet. 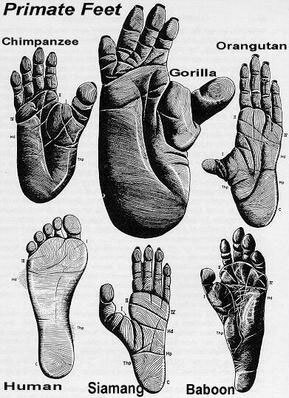 Keywords: Human evolution, hand, foot, homologous structures, adaptations. Overarching learning goal: By participating in this lesson students will understand the significance of the opposable thumb in humans and how this has influenced our evolution. They will recognise a range of adaptations of the human hand and foot, and will understand how human feet and hands may have evolved from the same homologous structure. 5 - 10 minutes - Looking at images of hands and feet. 50 - 55 minutes - Hand and foot adaptation activities. 5 minutes - Reflection questions. Step 1. Ask students to look at the images below comparing human and animal hands and feet (also available on the Student Worksheet). 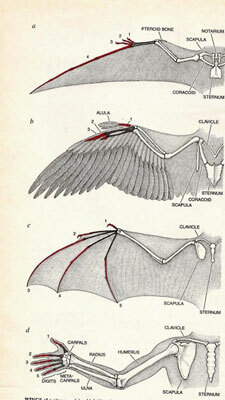 Working as a class, briefly compare these differences, speculating on how and why they evolved in different ways. Thought starter: What other animals use tools? Introduction - How are we different to animals? 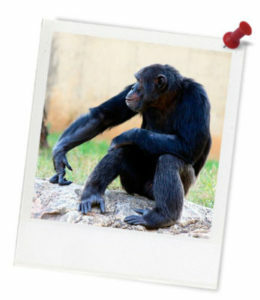 Look at the images below comparing animal feet and arms/wings with human feet and arms. What are the significant differences and why do you think these exist? How and why did they evolve in these ways? When studying the evolution of humans, we can see that there were several significant steps on the way to becoming modern humans. One of these is brain size, another is the shape of our skull and jaw, another is the slope of our legs and our ability to walk bipedally, and another is the use of tools. The use of tools is important because it shows that our hands have evolved enough to grip these tools.